A user group from Cardiff University in the UK performed a DERri user project Electric vehicles control with multi-agent system (EVOLVE-MAS) in the spring of 2011 at the premises of TECNALIA. The purpose of EVOLVE-MAS was to test the operation of a Multi-Agent System (MAS) developed at Cardiff University. The design of the Multi-agent system is based on the structure proposed by the EU project Mobile Energy Resources in Grids of Electricity (MERGE) www.merge.eu . The outcome of the project is documented in the EVOLVE-MAS Fact Sheet. 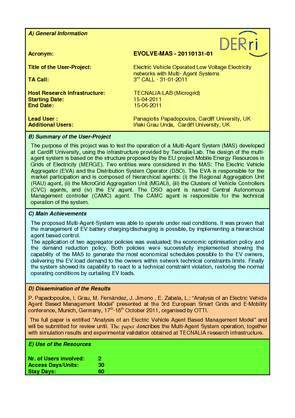 A conference paper describing the MAS operation and the simulation results and experimental validation during the user project was published at the 3rd European Smart Grids and E-Mobility Conference in the autumn of 2011.